1. Pour all ingredients into a Collins glass over crushed ice and give it a good swizzle. 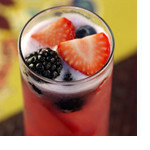 Top it off with crushed ice and garnish it with fresh seasonal berries.